Ever wonder what the inside of your eye looks like? Now you can see what the Optometrist sees! 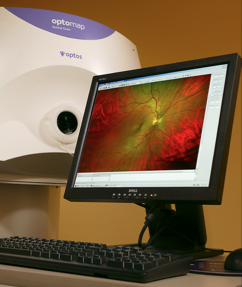 Both of our offices now offer high resolution retinal photography, which uses a computer integrated digital imaging system to record a detailed view of the retina. Since nothing touches the eye, this procedure is painless and provides an excellent reference point for future comparisons. Furthermore, in most cases these digital images can be obtained without dilating the eye!